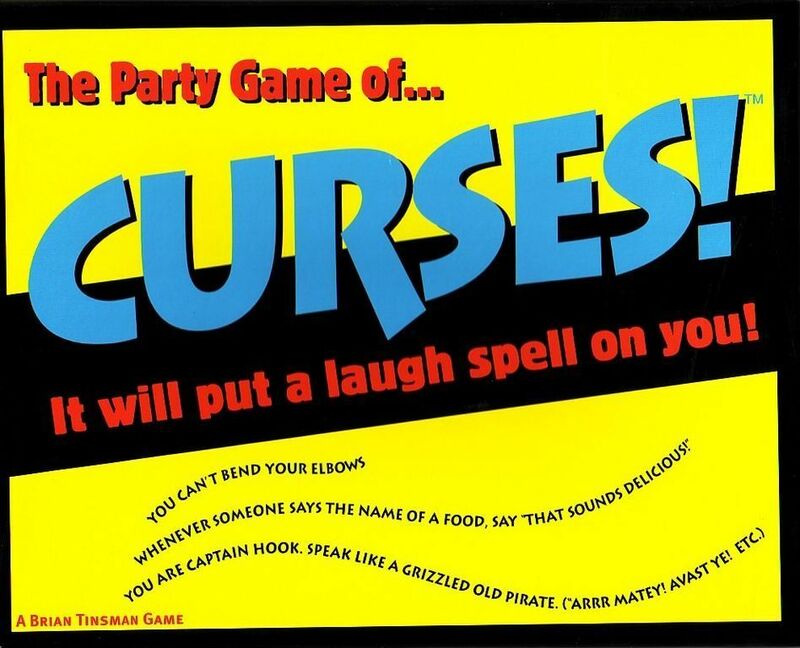 Each player starts the party game Curses! by drawing one Curse card and placing it face-up on the table. What? Curses? How can this be a party?! Ah, but these Curses are fun, not malicious, something along the lines of "You can't bend your elbows" or "You must declare eternal love to anyone who rings the bell during this game". Draw a Challenge card. This card presents you with an action you must perform – a role to act out, a story to tell, an opinion to explain. Draw a Curse card and give it to another player. "You, bark like a dog whenever the player on your right reads a card!" So where's the game? You must obey the Curses placed upon you at all times – and if someone notices that you're not barking or declaring eternal love or doing whatever else it is you're supposed to be doing, then that player rings the central bell and reveals you for a louse and a nogoodnik. As a penalty, you must turn the Curse card you violated face down. And while you might think that lifting a Curse is good, break three Curses and you're out of the game. Eventually only one person will remain, and this Curse-loving looney wins the game!